Local Republican cabal refuses to take “Yes” for an answer in attempt to refight pension battle they’ve already won. Republicans in this town must be getting desperate. How else do you explain Republican strategist Tony Manolatos putting together a press conference to bash Democratic mayoral candidate Bob Filner on something that has been settled policy for quite some time, and to my knowledge has not changed since the primary election last June? I’ve covered the issue here and here. Filner had his own pension reform plan that he touted during the primary campaign. That plan included refinancing the city’s pension debt in order to take advantage of historically low interest rates and to lower the city’s debt payments, thereby freeing up funds for other vital city functions. But ever since Prop B won at the ballot box in June, Filner has accepted defeat on that measure and assured the voters of San Diego that he would follow their will and implement Prop B. In fact, Filner says that he’s the only one of the two mayoral candidates who can implement Prop B, since Prop B requires a five year pensionable pay freeze in order to make it save the $963 million Carl DeMaio claims it will save. The pay freeze will have to be negotiated with the unions, and the chances that a Mayor DeMaio will make any headway with the unions are slim to none. Filner, on the other hand…..
And that’s where we stand: Filner says he will dutifully implement Prop B as mandated by the voters of this fair city. That’s been the word from the Filner camp ever since. Nary a peep to the contrary. “San Diegans expect results from City Hall that fix problems and improve neighborhoods, not schemes that could squander hundreds of millions of taxpayer dollars,” declared City Councilman Kevin Faulconer according to the press statement. “Bob Filner’s pension proposal will cost San Diegans hundreds of millions of dollars, taking away tax dollars for libraries, police officers, and fire stations in the future,” bemoaned Lani Lutar, the president of the San Diego County Taxpayers Association. 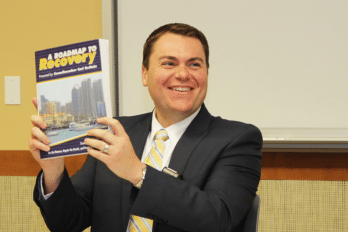 “Taking out another credit card to stretch out payment on the City’s pension debt and racking up hundreds of millions of dollars in additional interest is exactly the kind of risky move that got City Hall into the pension mess to begin with,” whined Carl DeMaio. Except that there no longer is any “risky pension borrowing plan.” Filner scrapped it after Prop B won. The local Republican cabal is trying to revive a debate that they’ve already won. Apparently they’re incapable of taking “Yes” for an answer. That’s been Filner’s position since July when the issue was first brought up following the lull after the primary election. To the best of my knowledge he has not changed that position. A phone call to Filner’s campaign spokesperson yesterday confirmed that. The latest Republican puffery appears to stem from a Voice of San Diego piece from August 9th that questioned whether Filner really hearts Prop B. (Here’s a hint: No, he doesn’t, but he’s also a practical politician, as I noted in my previous pieces on the subject.) The Voice story stems from a 46 second video snippet from a speech Filner gave to the San Diego Kiwanis Club. In the video, Filner talks about the pension reform plan that he proposed during the primary. It is unclear whether Filner is using past or present tense in his talk; whether he says “I propose refinancing our debt” or “I proposed refinancing our debt.” It is clear that he says “I’d save $500 million” if his plan was implemented. Since the video only conveniently contains 46 seconds of what was surely a much longer speech, the larger context of what Filner was saying is completely missing. There is no way of knowing from just that brief clip whether Filner was talking about what he had proposed during the primary campaign as an alternative to Prop B, or whether he’s speaking in present tense terms and presenting what he would like to do should he be elected mayor. One thing you can be certain of: That clip was deliberately edited that way in order to present the appearance that Filner has not in actuality abandoned his pension reform plan. It’s the kind of chicanery Republicans are best known for: Creative editing in order to deliberately take things out of context. Just ask Mitt Romney and his campaign. Requests for comment from the Filner campaign on the VOSD story and video have not been answered. The whole thing smacks of pure desperation on the part of local Republican leaders. And why would they be desperate? Could it be that they simply don’t have the facts on their side and feel that they have to manufacture a controversy in order to advance their cause? Wouldn’t be the first time. Could it have something to do with the fact that Carl DeMaio is getting pummeled in the latest polling, trailing Bob Filner by 12 points? That’s it. That’s their rationale. They don’t “take Bob for his word.” As if Carl DeMaio has a track record of honesty and transparency. As if Carl has proven that we can just “take him for his word.” But I guess when you’re desperate and that’s all you’ve got, then you just run with it and hope it sticks. I’m guessing this won’t. It’s too bad Filner’s press people have clammed up with the media. Nothing good can come from that. Yeah, I’m kind of baffled by that myself. Doesn’t really make much sense. Is Tony M a Republican? Barry: You know I’m a DTS who leans to the right on fiscal issues and to the left on social ones. Andy likes to address me as, “Hey, genius” in emails…so maybe he should have just went with that. I sorta like it. As I readily admitted, Tony: No small amount of snark. Yes, I was kinda being a jerk, but that whole presser and the premise behind it was a reach at best. This is more of what has become rethug campaign policy. They have no winning issues, no winning candidates and can only offer this kind of campaign nonsense to distract potential voters from noticing their lack of substance.